Keep the Film Office Open! With all the discussion of the film incentive, people often forget that if the Motion Picture Competitiveness Program goes away… so does the official State Film Office. In our latest Keep Film in WA infographic, not only do we highlight the direct dollars that the Film Office division brings to communities across the state ($7.2 million last year! ), but we also give people a glimpse of all the production resources that live under the Film Office umbrella. The State Film Office fulfills so many key functions throughout the filmmaking process, particularly early on. Productions will contact the State Film Office and explain what they’re looking for, and the Film Office will work to connect that production with all the necessary resources, here in Washington, aiming to meet the needs of both filmmakers and local communities in a way that is mutually beneficial. Whether you’re looking to shoot a movie on a decommissioned Navy vessel or just trying to find a local camera operator, your first call is to the State Film Office. It operates and maintains databases of Washington State locations and crew, and because of this wealth of knowledge, it’s often the point of entry for productions looking to bring their production (and production dollars) to our state. Anyone who has worked on productions in Washington knows that the absence of this office would be deeply felt. The State Film Office is truly an unsung hero of our state’s film industry. Unless you’re a working member of the film community, you may not even know it exists, let alone understand the extent of its role in film production. This infographic is a great educational piece about the State Film Office. Share it on social media to help spread the knowledge, and please take a moment to send it to your legislators to remind them what an important institution and invaluable public resource we stand to lose if the Motion Picture Competitiveness Program, which provides for the existence of the State Film Office, is allowed to expire on June 30. Today The Stranger published a letter from some of Washington State’s most successful female filmmakers that was addressed to House Finance Chair Kristine Lytton (40, D). Because the film industry has not been able to meet face-to-face with Representative Lytton this legislative session, the letter is a very powerful and public plea to save the Motion Picture Competitiveness Program (MPCP). The letter reminds Representative Lytton that the MPCP has great support on both sides of the aisle and that organizations such as the Washington State Labor Council and the Association of Washington Businesses support its renewal. The bill to renew the MPCP is stuck in the House Finance Committee (despite the fact that more than half of the committee members are sponsors of the bill). The clock is ticking and we must work together to remind key budget negotiators that this bill has wide and unwavering support. Take this letter and share it with your elected officials and the following key budget negotiators. Ask them to include the MPCP in the final budget. The future of film in this state depends on it. Today marks the end of the second 30-day special session and (not surprisingly) Governor Inslee called the start of the third special session immediately. This article from The Everett Herald sheds some light on the state of the negotiations for the 2-year operating budget. With the end of the fiscal year looming on June 30, the pressure is truly on. If the budget remains unresolved by that date, now less than 10 days away, Washington will experience a partial government shutdown with sweeping effects across the state. As before, the legislation to renew the Motion Picture Competitiveness Program (MPCP) is considered Necessary to the Implementation of the Budget (NTIB) and thus remains on the negotiating table and in play during this special session. Please write, email, or call your legislators and ask them to ensure that the final budget includes an extension of the MPCP. Remind them that if the MPCP is allowed to expire on June 30, Washington will lose the state film incentive, putting the our film industry at a deep disadvantage when bidding for future productions. The expiration of the MPCP would also mean the end of the State Film Office, making Washington the only state in the nation without one. We cannot allow this to happen. If you’ve spoken with your legislators in the past, please reach out again and renew the dialogue. 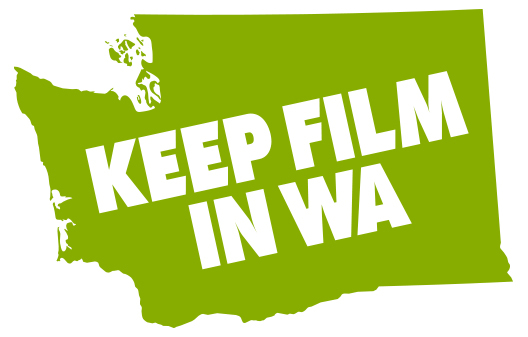 It is absolutely critical for the Keep Film in WA campaign that the film professionals of Washington State let their advocacy for the MPCP be heard in Olympia.